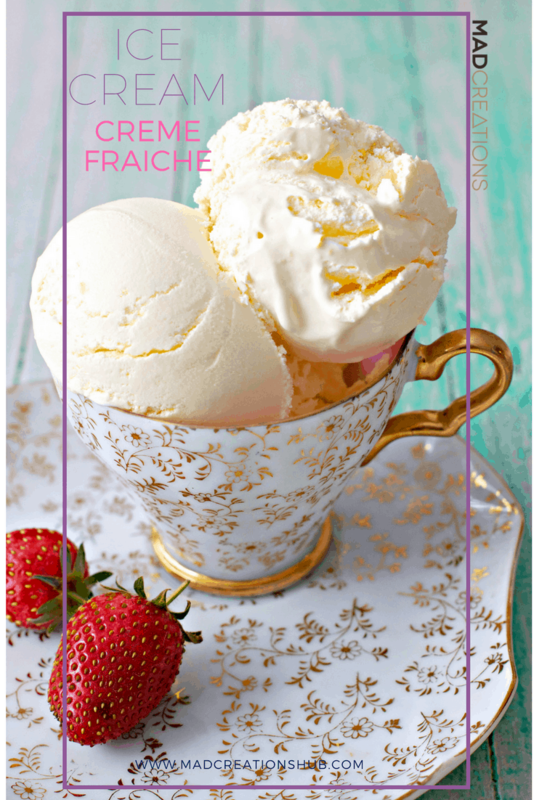 This creme fraiche ice cream has a beautiful lightness and just the perfect bit of twang to it. A truly refreshing ice cream. When I came up with this recipe I was looking for a flavour that was delicate enough to enjoy on its own or simple enough to be able to enjoy a topping or two on it. The ice cream is lusciously soft and creamy. I use vegetable glycerine in my ice creams as it really helps to continue to keep the ice cream soft and creamy even when it isn’t consumed over the first day or two. With just a few teaspoons it makes such a difference. This is probably one of my favourite ice cream recipes I make. Just because it is so simple and so bloody fabulous. A simple yet beautifully tangy ice cream that everyone will love. Pour into ice cream maker and churn according to manufacturer’s instructions. Pour into a container and freeze for minimum 2 hours or until firm. Vegetable glycerine is available from health and specialty food stores. It is used to help keep the ice cream soft and scoopable. If unavailable use a teaspoon of guar gum instead. Yummm yum yum!! Thanks for a great, simple and tasty treat!! What do you do if you don’t have an ice cream maker, I would love to try this. I have read somewhere else that you freeze the mix and every 4 hours take it out of freezer an beat it. Just made this today. Couldn’t even wait for it to freeze firm. I just HAD to try it. Absolutely delicious and so easy to make.